In many therapeutic areas, current treatments involve significant side effects. Combining drug compounds with affinity agents that target specific cell surface receptors can dramatically reduce off-target effects and improve treatment effectiveness. In several studies, aptamer-mediated drug delivery has reduced toxicity and improved drug performance. 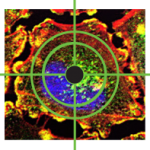 Whether you have a cell type of interest or have identified a specific cell surface target, the first step in aptamer-mediated drug delivery is discovery of selective aptamers. Base Pair has discovered aptamers to cells, cell surface markers, small molecule drugs and drug metabolites. Base Pair’s patented multiplex selection enables simultaneous discovery of selective aptamers to a panel of positive and negative targets, reducing the overall time and cost of aptamer discovery and improving aptamer selectivity. Contact Base Pair to learn more. Monaco, I., et al. Aptamer functionalization of nanosystems for glioblastoma targeting through the blood-brain barrier. Journal of Medicinal Chemistry. 60:4510-4516. 2017. Pusuluri, A., et al. Treating tumors at low drug doses using an aptamer-peptide synergistic drug conjugate . Angewandte Chemie International Edition. 2019. 58(5):1437-1441. Wen, J., et al. A unique aptamer-drug conjugate for targeted therapy of multiple myeloma. Leukemia. 2016. 30: 987–991.